Design by Omer Arbel. Made in Vancouver, Canada by Bocci. The 14.14 is a linear chandelier comprised of 14 cast glass pendants. Each individual pendant is an articulated, seamed, cast glass sphere with a frosted cylindrical void which houses a 10 watt xenon or halogen lamp. 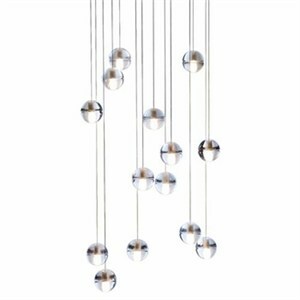 Unlike most contemporary lighting, the 14 Series pendants are visually quite subtle in and of themselves - like many tiny candles encased in floating spheres of water. The light interacts with the imperfections and bubbles of the cast glass to make a visually rich halo of light. Cast glass is an organic process - imperfect by nature - so each piece produced is unique. Rectangular white powder coated canopy with braided metal coaxial cables. The 14.14 is equipped with "Headphone jack" hardware, allowing the canopy to be mounted on its own, and then the preset length pendants can be individually "plugged in". Pendants CANNOT be shortened in the field. When ordering please specify the longest height (10 feet max) and the shortest height. Heights are measured from the ceiling to the bottom of the sphere. The remaining pendants will be at random heights between the maximum and the minimum. Main photo by Cory Dawson.